All of our patients are asked to fill in outcome questionnaires before and after their treatment and then at 3 and 12 months after their treatment has ended, so that we are able to demonstrate the immediate and long-term effectiveness of what we do. We use a headache questionnaire called HIT-6 which is a well validated measure of how significant an impact our patients headaches are on their lives. 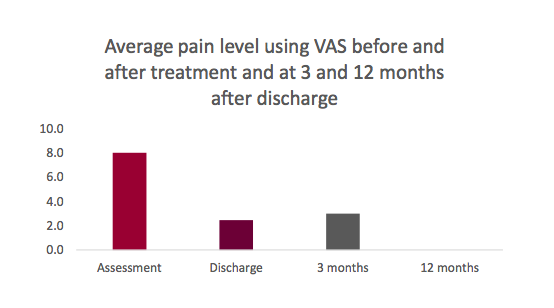 Patients are also asked report the severity of pain and the frequency of medication use before and after their treatment. Before starting treatment, 66% of the patients indicated that they used medication “very often” or “always” when having a headache. Immediately after the course treatment this had fallen to only 9%, with 64% never needing to use medication at all.